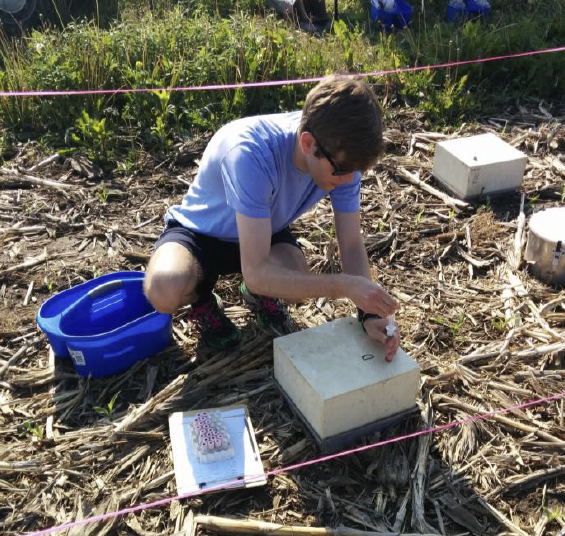 Each summer the KBS LTER supports students to participate in the Research Experiences for Undergraduates (REU) program, funded by the NSF. 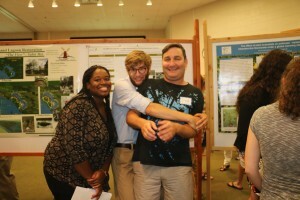 This is part of a larger undergraduate research program at KBS. Rick Moyer is majoring in environmental studies at Albright College. He wrote about his REU experience working with KBS LTER Postdoctoral Research Associate Ilya Gelfand in Phil Robertson’s lab. Rick, his mentor Ilya, and Asia – an undergrad research intern – at the KBS Undergrad Research Symposium. If you are ever offered a position at the Kellogg Biological Station, wipe all expectations from your mind and use that saved space to learn the game of euchre. When I received the email informing me that I had been accepted to conduct research at KBS, my mind raced with expectations, all of them wild. Coming to Michigan was the first time I had ever been on a plane, so I was nervous. All the Googling in the world can’t help you when you’ve spent virtually every night of your life laying your head in the exact same room in your mom’s house. I was scared to be working in a field that was not my own – I left the environmental sciences early in my education to delve deeper into the worlds of law and politics. The thought of spending three months knee-deep in discussions about “soil microbial pathways” and “diurnal nitrous oxide flux patterns” left me feeling so small, so pathetic. I tried to picture the people I’d be working with, but that image was no more comforting: a bunch of Urkel-esque characters came to mind, so enthused by conversations on the minutiae of biology and microscopes that they could barely find the time to breathe. My mentor for the summer, the man who interviewed me, certainly didn’t quell my fears either. His thick Israeli-Russian accented English was barely discernible during the interview – how was I supposed to not only learn about this field totally foreign to me, but then develop novel research about it, from a man who I could hardly understand? Expecting to spend over 400 hours in a lab poring over glorified dirt clods with a bunch of nerds at the behest of man whose demeanor is so overwhelming it might as well be its own person, I feared the worst possible scenario. If only I could travel back in time and warn myself that the seven (7) panic attacks I had in the 24 hours leading up to my arrival would all be for naught. Despite all my contrived nightmares, I expected that I would learn a lot this summer and return home with some life-changing experiences, and much to my relief I can honestly say, that was the only expectation that panned out. Where to even begin? Perhaps the most important thing: the food. It was awesome, there was dessert at every meal (that’s right, breakfast too), and I will conceded that I definitely gained more than a few pounds – but moving on. In all seriousness, this summer was an absolute pleasure. My work environment was much less lab-y and much more middle-of-a-field-y, to my intense delight. Sure, the mosquitoes at dusk were hellishly persistent, but in my Argonautic pursuit of science and truth, I thrusted onward through the relentless swarms. My work soon became interesting when I realized the implications of my research; as my mentor explained, we may be contributing to a body of knowledge that eventually alters how the International Panel on Climate Change estimates greenhouse gas emissions from agriculture! Okay, that doesn’t sound as exciting as it did in my head, but that exclamation mark should have added some dramatic flair. I mean, nitrous oxide is a greenhouse gas 300 times as potent as carbon dioxide, that pesky molecule that threatens the existence of life on Earth – which has to be of some import to even the most science-adverse reader. Don’t get me wrong, taking hundreds of gas samples from dawn until well past dusk in the same thirty square-meter plot isn’t the most glamorous job, but you keep your head held high and focus on what it’s all for: the proud knowledge that you uncovered a piece of truth about how the world works and planted a flag with your name into it. 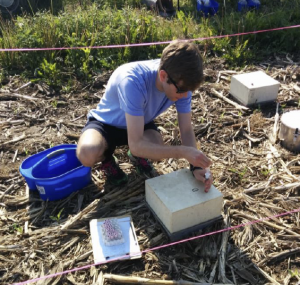 My experience at the Kellogg Biological Station this summer was one of incredible learning and development, as a student, an employee, and a person. As a scholar of environmental humanities, the prospect of being dropped into the world of hard sciences and forced to carve out my own little piece of reality was daunting. It turns out, however, that my education was not all so different from that of my peers, in that we were all there not because of our idiosyncratic passions, but because of our devotion to learning, our drive to succeed, our ardent resourcefulness. Though I have focused my education on history, philosophy, politics, and law, while my KBS peers chose rigorous paths of mathematics, engineering, and biology, my scientific achievements this summer were little different from theirs in both the quantity and quality of results. I recalled the methodology of inference and deduction from a political science class; academic poster design and public speaking from a computing class; use of library resources and citation criteria from an English class. Moreover, my ability to think critically, write effectively, and present my thoughts to various audiences in a way that is clear and meaningful, having been honed at college, proved an invaluable tool in my success at KBS. The bottom line is that your background doesn’t matter; so long as you are enthusiastic about the work you do and have a drive to achieve scientific greatness, you’ll produce quality research you can be proud of. As I reflect on my time at KBS, I am struck by the impact that people had on my time there. You would think that moving halfway across the country for a job that dunks you in a heaping truckload of science for twelve weeks would make your work life your only life, but your job takes a surprising back seat in that experimental pickup, while a motley crew of peers, coworkers, and mentors takes the wheel and hurtles you through this estival adventure. Instead of grieving for the hours I’d waste in a lab with nothing but the whirl of a gas chromatograph to comfort me, I should have spent more time worrying about having so much fun that I completely forgot about the work, got fired, and wound up living in a tree (like the unemployable squirrel I so resemble). If ever you find yourself lucky enough to land a research position at KBS, don’t come because it pays well and looks good on your resume; that’s all too objective and quantifiable. The real allure is the invaluable chance to be a part of a community of people just like you, who will help you to develop in ways you’d never be able to expect – and the unexpected is oh-so wonderful. Rick Moyer collecting gas samples from the LTER research site.